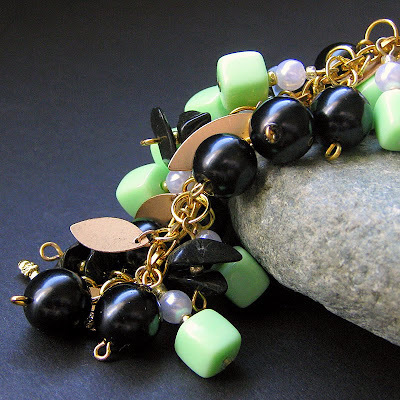 A custom request from a wonderful customer, this beautiful handmade bracelet is made with just a hint of Leo's birthstone (onyx) tucked in among clusters of pretty blue and green glass beads. All brought together on a silver plated chain that's further decorated in pretty, custom requested charms. Combining the styles of ID bracelet, charm bracelet and cluster bracelet together into one piece, a heart shaped silver plated toggle clasp and shiny pewter letters spelling out the name "Ashlee" in charming accents finish off the piece. Bracelet is 8.5" in length (22 cm) including clasp. A beautiful pearl necklace made of green, wine and cream pearl beads linked to metal squares with purple iridescent inlay combine to create a vineyard inspired style. This item is a custom order for M.H. 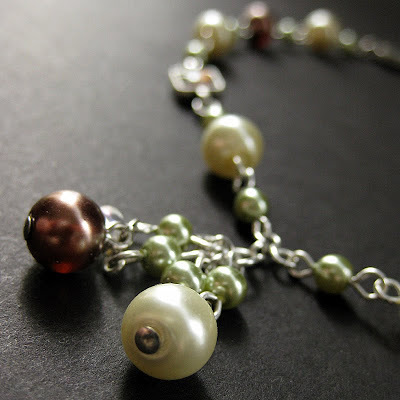 made to match the Grapes to Wine Pearl Link Bracelet and matching Vineyard earrings. The lobster claw clasp at the nape hooks to a chain that allows this necklace to be worn tight enough to be a choker or loose enough to lie against the chest while a small pearl bead bauble at the end of the chain gives an extra bit of decorative touch. 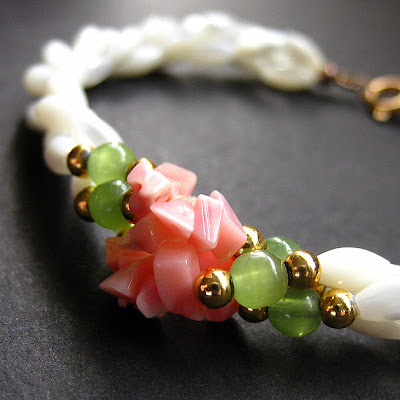 Swirling tendrils of 72 mother of pearl beads intertwine together in this handcrafted bracelet; a burst of vibrant color at its center with a cluster of coral chips combined with sea green aventurine beads. This shimmering concoction easily able to be imagined having been plucked directly from the treasure chest of the most beautiful mermaid in all creation, Poseidon's daughter. 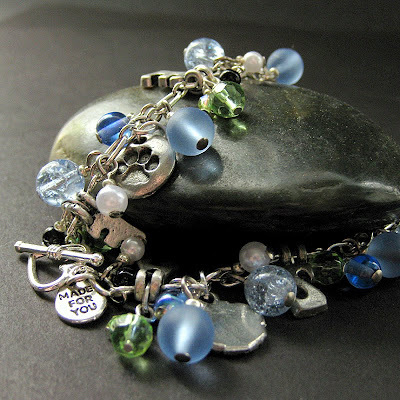 Bracelet is 7.75" length (20 cm) including clasp. 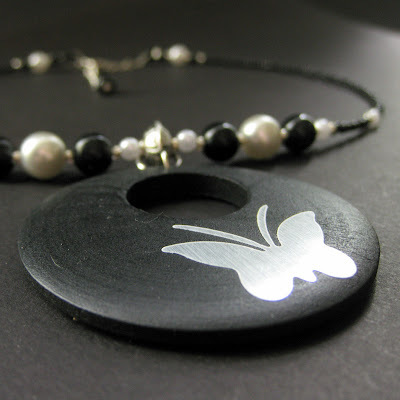 A handmade beaded choker necklace made of white pearls and seed beads accenting a black wooden circular pendant with a butterfly set off-center on its surface in brushed silver tones. The lobster claw clasp at the nape hooks to a chain that allows this necklace to be worn tight enough to be a choker or loose enough to lie against your chest while a small bead bauble at the end of the chain gives an extra bit of decorative touch.